Re: Getting Rid of Stuff. 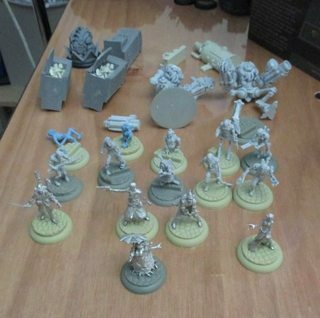 Does anyone want an old Wild West Exodus Starter set plus the old undead/Carpathian (I think?) set? It's free or I'm binning it. 4 of the square Bandua lasercut building sets for infinity (12 buildings in all). Unpainted, includes 4 bridges. Also free. I have a lot of Van Rier (I think) for Wolsung I'm never going to use. It's in various states of disrepair, includes several metal characters, quite a few zombies and 2 of the big golems and several phonebooths, £15 for the lot. I can bring them to club for a look over before purchase! Anyone want a 28mm scale sloop, I've had it for almost a decade now. It's one mast, and free. Unpainted etc. Enough dust to count as painted. Bunch of Dropfleet Commander stuff, one starter with an extra scourge fleet and big ship in resin, plus plastic fighters and space station boxes. Frankly given the limbo this is in, I'm happy to give it away free. A very large amount of ogre kingdoms stuff, if anyone is interested a lot of it is still boxed and I can bring it in and happy for offers. Low offers at that! More may be added to this list as I dig through. I wouldn't mind a look at the Ven Rier David, when will you be around at club next? I can come down tomorrow if you're about. Sounds good to me, any particular time? I'll try to get there for around 5. I'll take the wild west exodus stuff David. It can join my Watchers and Hex in the storage cupboard. Anything your after in exchange (I know you're giving it away, but.....). As it looks very likely I will appear this weekend, I'm intending to bring down a 'bag' of stuff I no longer need/require/want. And John, I'll have that Wolsung stuff, originally asked £20, but as I've mucked you about so much, £15 will do. No cards though, you've had all I have already. Thats a hell of a deal there David. There are no cards mind, they were bought in 1st edition and I can't find the cards anyway.